Thanks, Val. Back at ya. 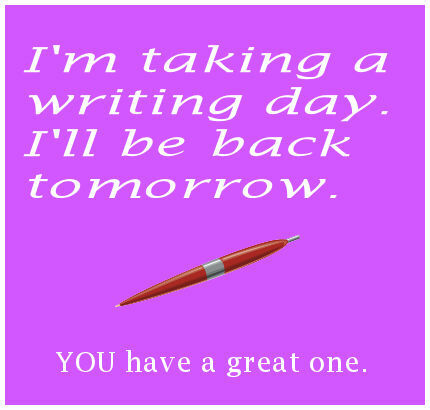 I hope your writing day is productive and satisfying. Thanks, EC. I made a dent. Have a great day Sandra. Thanks so much, Yvonne. You too. Does that work for the 9-5? Thank you so much, Ro. Thanks, Jamie. Hope you did. Have a beautiful writing day and I just know that you will write a BEST SELLER!!! It's good to NOT be interrupted at times. I hope this is also a productive day. Hope you had a great writing day! Big Hugs Sandra!